We here at Cook with Me Darling pride ourselves on making beautiful meals that are also easy, healthy, and require little cooking time. This Steak with Citrus and Avocado Salad for Two is an excellent example of ease and elegance. And it’s perfect for any romantic holiday or celebration. This pan seared filet mignon is finished in the oven to your liking! I prefer mine medium rare, my husband likes his ruined…I mean well done…. but fortunately we can both be happy. A little timing is all it takes to achieve the perfect amount of “doneness” for all. Tender butter leaf lettuce, ripe avocado, and an assortment of citrus dotted with salty pistachios and pomegranate seeds makes this salad a colorful delight for the eyes as well as tantalizing for the taste buds! The Dressing: You have Two Choices! For this lovely winter salad we offer two dressing options: white balsamic vinaigrette and lemon vinaigrette! We LOVE a good white balsamic, but we also know not everyone wants to buy a vinegar (even if it is extraordinary!) so we also offer a simple lemon and olive oil version. You choose. Both are fabulous. 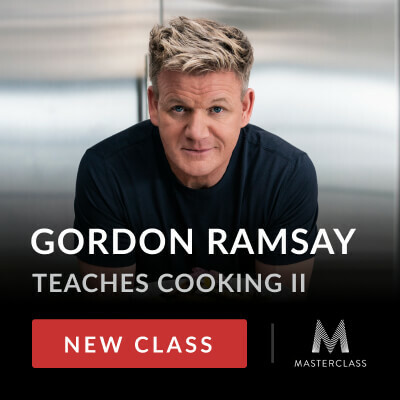 Gordon Ramsay Teaches Cooking II: Restaurant Recipes at Home! Obviously we encourage cooking together but if you are cooking alone you can whip out this meal in about 20 minutes. If one of you handles the salad while the other takes care of the steaks, you could be eating this meal in under 12 minutes! The Recipe: Steak with Citrus and Avocado Salad for Two! What you need: a fabulous grill pan, a good knife and a great sea salt (buy the tub to save money!) If you are choosing to make the white balsamic dressing you’ll need a great quality white balsamic. I could drink this stuff right out of the bottle! A gorgeous winter steak and salad meal! Remove steaks and set on plate to rest for five minutes. Steak and avocado, such a yummy combo! Some of my favorite foods! Looks great. oh the flavors in this salad Linda! Such a dream, and so darn easy to whip up! Thanks Tessa! Yes so quick to assemble! These flavors sound amazing! Can’t wait to try this. Mmm! What a delicious looking salad! Avocados and all…. haha! What a gorgeous salad! So easy too. Is it wrong to want both of these salads 🙂 Ok, I promise I’ll share! Perfect balance between sweet and savory and I love making meals for two people. So romantic!